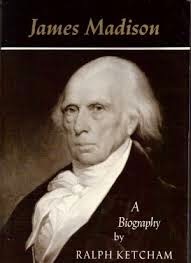 James Madison: A Biography by Ralph Ketcham is a massively large and comprehensive work. My ruminations on its level of detail and why I chose to read it can be found here. Kethcham’s biography is not just filled with facts, but in my opinion it strikes exactly the right balance of analysis and commentary concerning Madison and the era in which he lived. This is huge book. Its pages are large and the print is small. As I estimated in my previous post, had this book been conventionally formatted, I think that it would run over 1000 pages. I could not help but smile when in the introduction Ketcham apologizes to his readers for his lack of detail and refers those who want more to Irving Brant’s six-volume biography of the America’s fourth President. First published in 1971, Ketcham’s book has become the seminal Madison biography for those interested in a detailed portrait of the man. Based upon a little Internet surfing on the work, it seems to garner great respect from both academics and lay readers and seems to eclipse more recent shorter biographies of Madison written by popular authors. Born in 1751 to a prosperous Virginia family, Madison grew up exposed to the best education that the New World offered at the time. For his higher education, Madison attended The College of New Jersey, later Princeton University. This institution was a breeding ground for New Light Presbyterianism and Revolutionary thought in America. Ketcham devotes plenty of pages to explaining how Madison’s intellectual foundations can be traced to his time spent there. Beginning before the Revolution, throughout the war, and later in an independent America, Madison served in various State and Pre-Constitution Federal Legislatures. During this time, he gained a reputation as an extremely competent and even brilliant political theoretician and legislator. Ketcham dedicates pages and pages to Madison’s political theorizing, which borrowed and built upon classical and enlightenment thinking. Madison was indeed a great political thinker. He really came into his own during the 1787 Constitutional Convention, which led to the creation of the American Constitution. Many, including Ketcham, describe him as the Father of the United States’ Constitution. Though I have read other authors, particularly James Lincoln Collier and Christopher Collier, who consider this a bit of an overstatement, he likely had a greater effect upon the final document than anyone else. Many of the most important features of his basic outline for the American Government made it into the Constitution. Madison pushed for a strong Federal Government as well as popular representation over what, at times, was vigorous opposition. Madison’s blueprint for the American government has had a profound impact down through the present day. In the fight to get the Constitution ratified, Madison co-authored the Federalist Papers. These works were landmarks in political theory that helped create and shape ideas that still represent some of the cornerstones of modern republics, balanced governments and political theory. Later Madison continued to serve in various capacities in the Federal Government, from Congressman to Secretary of State. During this time, he married Dolly Payne or Dolly Madison, a vivacious and dynamic woman whose distinctive personality contrasted with Madison’s somewhat socially awkward character. Dolly eventually became one of America’s most popular and famous First Ladies. In 1809, Madison was elected President of the United States. Serving two terms, this Founder’s time in office was often contentious and was marked by the War of 1812, in which the United States once again came into conflict with Great Britain. Madison’s presidency was also characterized by innovations in finance and infrastructure development that impacted America for decades to come. Ketcham does not pull any punches, and his picture of the Madison Administration is portrayed as a time of great mistakes that were balanced by some equally great achievements. After his term as President, Madison enjoyed a long retirement spent at his home in Montpelier, Virginia. Here, like many of America’s Founders, he engaged in a constant correspondence with other thinkers of the time. He also influenced, and sometimes participated in, both Virginia and National politics and the debates that characterized this time. Madison’s shortcomings are not glossed over. For instance, though he opposed slavery, he could never bring himself to actually free his slaves. He also, while popular with his family and friends, was a socially awkward man. As I am known to do, I will focus upon just one of many important aspects of Madison’s life. Madison was a vitally important figure, both in terms of his actions and political philosophy. Even if we confine ourselves to just examining Madison’s political philosophy and theorizing, there are too many fascinating and important angles to examine in a single post. Instead, I will spend a few words on just one thread of his political thinking. That is, Madison’s belief in, and championing of, an abundance and diversity of ideas, opinions and interests, especially when those ideas, opinions and interests contradicted each other. Ketcham details how Madison’s view on this matter grew over time. Madison initially made this argument in relation to religion only, when he advocated and helped to achieve religious freedom in Virginia. Madison believed a variety of groups, including various Christian denominations, Jews and non-religious thinkers should be free to exercise their beliefs without either interference or official support from government. He believed that such a separation of church and state, which was almost unheard of in Europe at the time, would actually strengthen society and religion. Later, Madison extended these theories to encapsulate a multiplicity of views and interests in society as a whole. Such a variety of ideas would help to create and foster good ones. Even the worst tendencies of human nature would cancel each other out when pitted against one another. Hence, the “neutralization” of “selfishness” that Ketcham refers to in the above quote. In analyzing modern democracy, we often hear political theorists and commentators observing the virtues of the “marketplace of ideas,” that is, the tendency for free societies to generate lots of ideas, both good and bad. Presumably, the good ideas will compete with the bad ones and win out. Though in my opinion this is not perfect and does not always work in the short and middle term, as some terrible ideas are very popular for what seems like long periods of time, this system does generally work in the very long run. It is indeed one of the engines that powers modern society. In his anticipation of this “marketplace of ideas” (this term actually precedes Madison’s time but in my opinion really achieved its full modern meaning in the twentieth century), as well as his role as an architect of a society that helped to foster such diversity, Madison displayed pure genius. There is so much to Madison’s life that is included to this very big book. This is not a read for the faint of heart as the detail can be overwhelming, and those who are not as interested as I am may find it a little tedious. Folks who have a great interest in the period, the history of government or of Madison himself will, however, find this an essential and very informative, yet fun, read. From time to time I will share some of my commentary on the Shakespearean Sonnets. I decided to cover Sonnets 5 and 6 together since they are linked together closely. In thee thy summer, ere thou be distilled. With beauty’s treasure, ere it be self-killed. If ten of thine ten times refigured thee. Here we have some themes that one will have already become familiar with, if one were reading through the sonnets in order. Once again, we are reminded that youth, vitality and beauty, as symbolized by summer and “lusty leaves,” will not last. Instead, it will give way to age and decline, as symbolized by winter and frost. Once again, we are eavesdropping on Shakespeare, or at least the voice of the poem, lecturing the Fair Youth that the remedy of such decline and eventual death as “make worms thine heir” is to procreate. What I find distinctive about this couple of sonnets is that the imagery, as well as the messages conveyed, are particularly strong and a little melodramatic. Some of this imagery is incredibly dark and stark. Summer gives way to “hideous Winter.” “Bareness” is “every where,” and “winter’s ragged hand” can “deface”. The youth is urged to avoid “death’s conquest and make worms thine heir.” These are quite a set of extremely ominous and dreary descriptors for the inevitable decline that we humans experience. 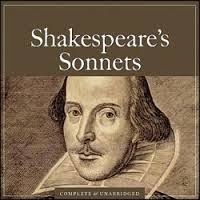 All of the above makes this set of sonnets particularly engaging and entertaining to read. Though one might make the argument that Shakespeare goes a little over the top here, one needs to keep in mind that there are 126 “Fair Youth Sonnets.” In my commentary on Sonnet 4, which is here, I concluded that the best descriptor for that verse was “clever,” as opposed to the grandness of some of the other sonnets. Here, we have more variation. It seems that Shakespeare was using this large body of short poems to express himself in diverse ways, from the very clever to the soaring sublime, to what I would argue here is slightly flamboyant. Ultimately, the tone of these two sonnets makes them a lot of fun to read. Doctor Thorne by Anthony Trollope is the third book in the author’s Chronicles of Barsetshire series. Though some familiar characters make short appearances, this entry mostly focuses on characters who were unseen residents of the county in the previous books. Dr. Thorne is a physician who operates on the outskirts of the county of Barchester. The narrative is mostly concerned with his niece, Mary Thorne, and her romantic interactions with Frank Gresham, heir of the squire of Greshamsbury. Mary is the illegitimate daughter of a poor, working class girl and the late, scandalously immoral brother of the Dr. Thorne. Upon her father’s death and her mother’s departure for America, Thorne adapts the infant Mary. Brought up by the headstrong but moral and decent doctor, Mary grows into her twenties as a person of substance. Thorne is a member of a distinguished family, but he himself is not wealthy. His slightly difficult personality gets him into moderate social and professional difficulties. Courted by the young Frank Gresham, Mary is placed into a compromising social situation. She has grown up with the Gresham children and is close to the family. The Greshams are members of the local gentry who have found themselves in great financial difficulty. Frank’s mother, the extremely overbearing, selfish and socially scheming Lady Arabella, is determined that Frank “marry money” and rescue the family from financial ruin. Much of the plot involves the efforts of Lady Arabella to keep Mary and Frank apart. Thus, Mary is banned from all social interaction with the Gresham family. This puts the ever suffering Mary in the position of a social pariah. Frank, in his ardor for Mary, eventually comes to resist his mother’s edicts. Though the two eventually become engaged, Frank’s mother continues to go to great lengths to prevent the marriage. Great aguish and sacrifice ensues for Mary. Unbeknownst to the Greshams, or to Mary, is the fact that Trollope’s heroine is the potential heir to another of her uncles’ fortune, which includes the mortgaged titles to the Gresham’s estate. There are numerous additional characters and subplots. Though filled with themes and ideas, the main philosophical thrust of the book explores the complex relationship between class, wealth, especially the wealth embodied by the new capitalistic class sprung from poverty, and genuine character. One thread of this involves what are the persistent efforts of the old aristocratic class, who have frequently fallen into hard financial times, to rescue themselves by marrying into the newly rich capitalist families. Multiple such arrangements are attempted as these upper class families attempt to arrange marriages for their sons and daughters into nouveau riche clans that they consider to be their social inferiors. Like the previous entries in the series, Trollope’s characters show incredible nuance. Even the best of them show some flaws. The weaknesses are indeed realistic shortcomings that are characteristic of real people. I am amazed at how well Trollope is able to craft such realistic personas. Those who don't approve of a middle-aged bachelor country doctor as a hero, may take the heir to Greshamsbury in his stead, and call the book, if it so please them, "The Loves and Adventures of Francis Newbold Gresham the Younger." Indeed Frank is virtuous, he shows his substance by choosing true love over money, he is loyal, respectful, etc. Trollope is better than this however, and there is often more here than initially meets the eye. A close reading of Frank reveals a few flaws. Like many young men, he shows a little narcissism and insensitivity. When Frank reveals his engagement to Mary, his conniving mother devises a plan to get him out of the country. Furthermore, under extreme familial pressure, he agrees to a complete embargo on correspondence and communication with Mary for a year or so. This decision puts Mary in a terrible position; she is already a social outcast as a result of Lady Arabella’ s machinations and is now alone and without support as she is subject to nasty social attacks. She is also subject to hearing mostly unfounded rumors of Frank’s infidelity to her while abroad. Isolated and without friends, Mary endures the hardships quietly and with grace. Frank, who really should know better, seems oblivious to all of this. He proceeds on a pleasant world tour. He flirts with women and is tempted to go further, but is convinced to stay true to Mary by the advice of his platonic, spirited and astute friend, Miss Dunstable. Trollope reveals more complexity. Even after his return, Frank comes under enormous and relentless pressure from family and friends to break the engagement. The pressure is exacerbated by the fact that his financial future with Mary looks to be bleaker and bleaker. It is almost understandable that he inwardly begins to harbor a few doubts. Once again, Trollope hints that if not for the influence of Miss Dunstable, the heir to squire of Greshamsbury would waiver. This is, of course, just one aspect to Frank. When one looks at the big picture he is mostly a noble character who does what is right, even while under great pressure. It is to Trollope’s credit that he has been fashioned with a few very believable imperfections. I found Doctor Thorne to be just a little less compelling then the previous two books. The plot seemed a little less interesting. What were innovations of style and character in the previous books are still wonderful touches here, but such touches are just not as unique as they were. Regardless, this is still an excellent novel. It is characterized by amusing and interesting characters, many of whom I have not even mentioned here. It is fairly well packed with ideas and musings upon life. It is funny and entertaining. Trollope continues to engage in his unorthodox point of view and use of meta-fiction, as I describe here. Highly recommended, but I would read the first two books first.